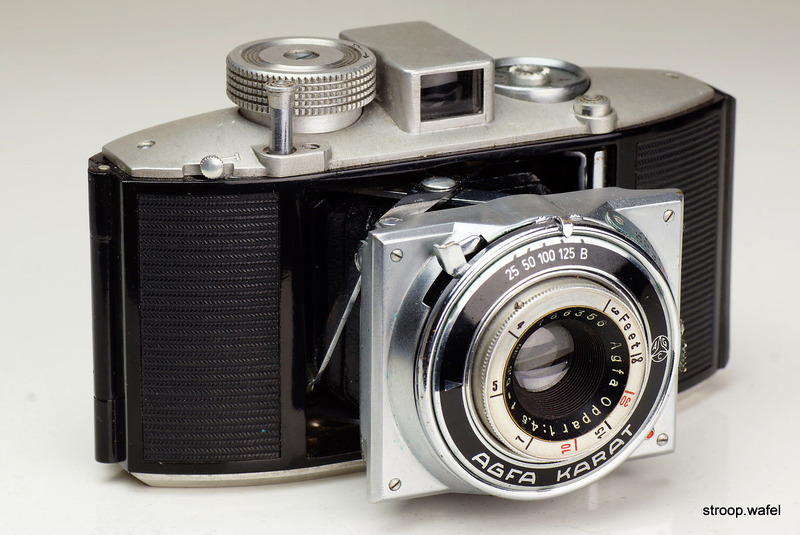 The Agfa Karat 6.3 to 3.5 were a range of small strutfolding cameras with a very distinctive design that used the Karat cassette system. 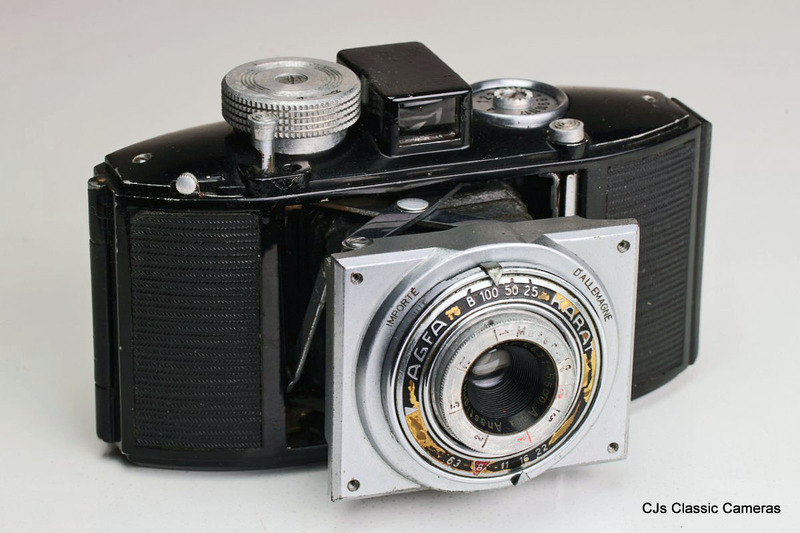 The model numbers stood for the maximum aperture of the lens. Although it is tempting to think that the Karat 6.3 was first, followed by the 4.5 and then the 3.5, this was actually not the case. The Karat 6.3 Art Deco certainly was the first Karat, but the next model was the Karat 3.5 was next. The 4.5 and 6.3 were introduced soon after and were in production simultaneously with the Karat 3.5. All versions received small updates during their production. After WWII only the Karat 3.5 was still produced for some time. The models and their variants are presented here roughly in chronological order. An early Karat 6.3 Art Deco with strap lugs integrated in the top housing, which was made of hard plastic. An early Karat 6.3 Art Deco with Karat cassette and film. This one has screwed strap lugs. 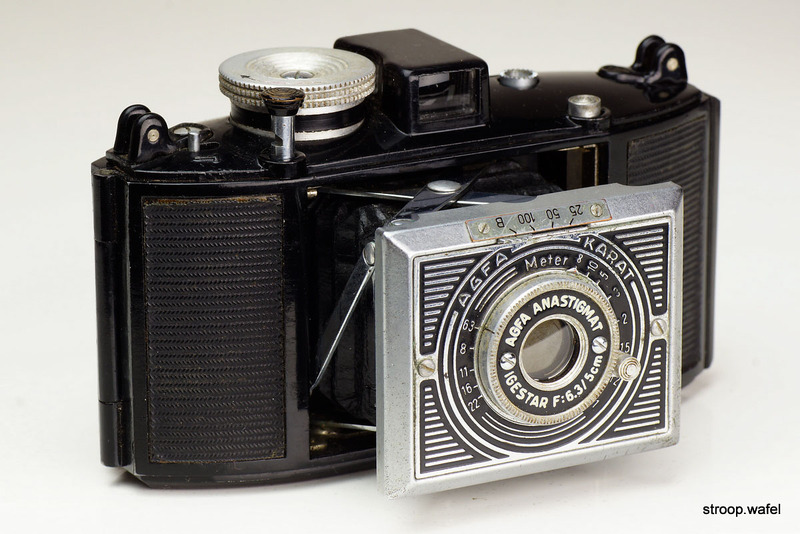 A late Karat 6.3 Art Deco with the higher viewfinder also found on other Karat models. A Karat 6.3 Art Deco with the top housing removed to expose the wind mechanism. Turning the wind knob would advance the film until the wind lock was activated, at which time the frame counter was forwarded and the double exposure lock was reset. 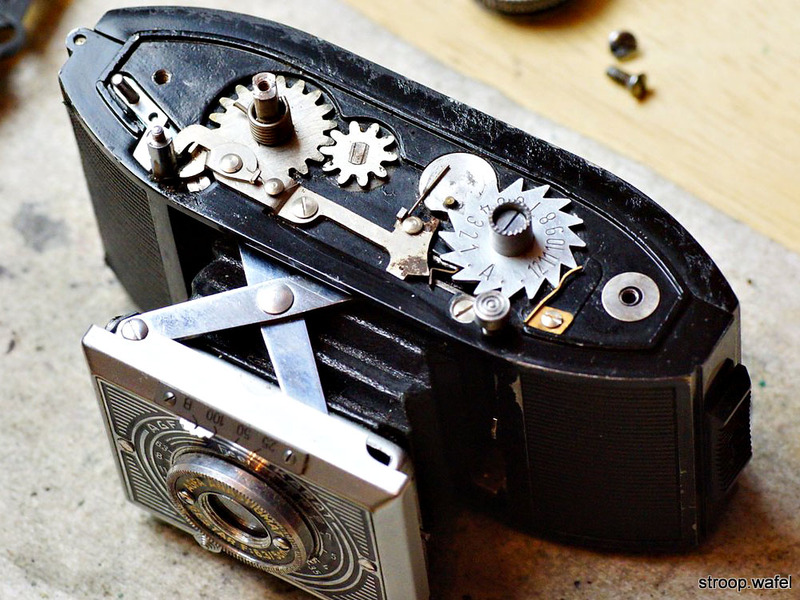 Pushing the shutter release button would reset the wind lock mechanism and activate the double exposure lock. French import version of the Karat 6.3 Art Deco, the only difference with the first model above being the small label 'Importé d'Allemagne' beneath the shutter. 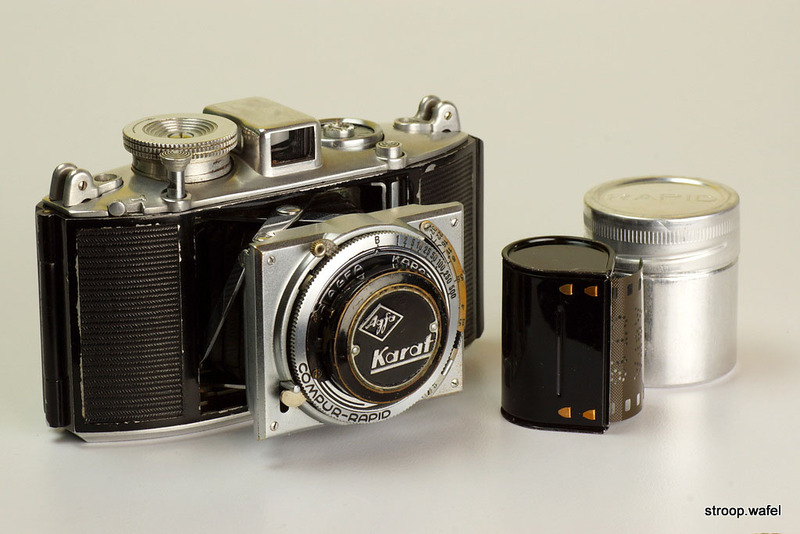 The Karat 3.5 was produced before and after WWII and they are often divided in pre-war and post-war models. 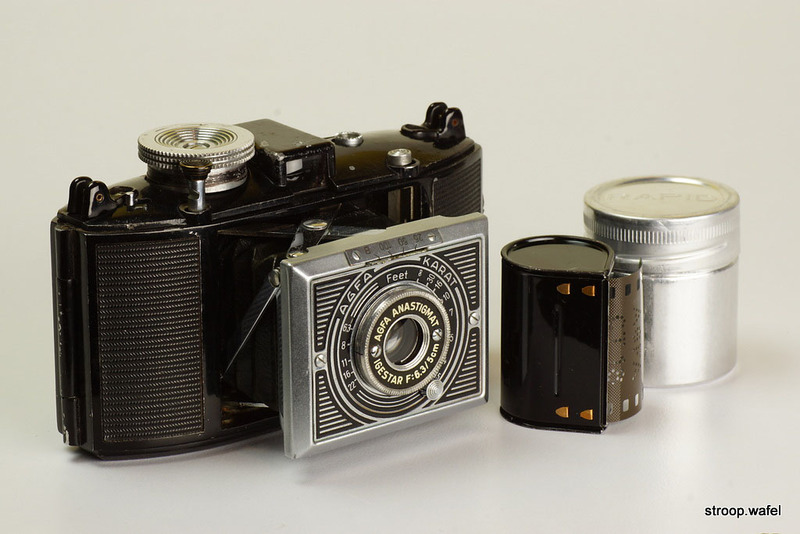 The main distinguishing feature between pre-war and post-war Karat 3.5 was the lens: all pre-war Karat 3.5 had a Solinar f/3.5 lens, whereas all post-war Karat 3.5 had a Apotar f/3.5 lens. Various sources on the internet state that pre-war Karat 3.5 had strap lugs and post-war did not. However, a pre-war version without strap lugs also existed (see v.2 below). The first version of the Karat 3.5 was introduced soon after the 6.3 Art Deco in 1937. 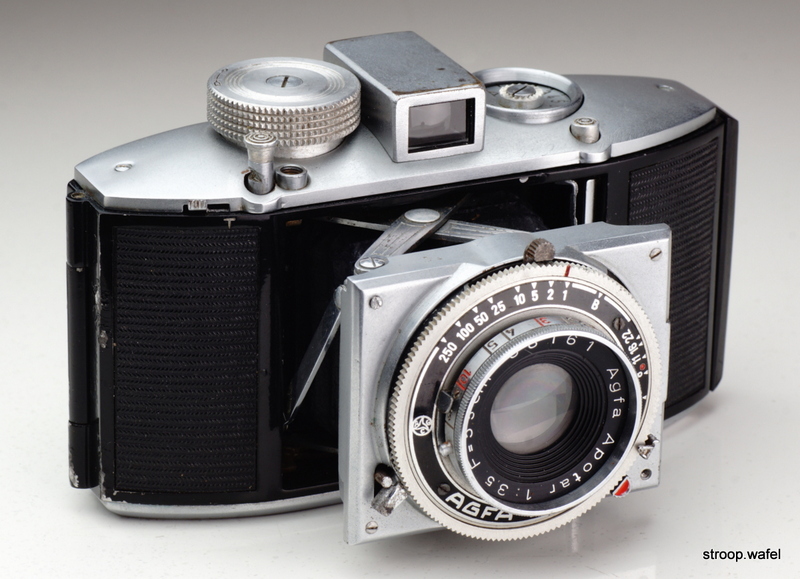 It featured a Compur or Compur-Rapid shutter and had a brushed aluminium top housing with strap lugs. It had a T button with the letter T embossed on the top housing. As mentioned, the lens was a Solinar f/3.5, an excellent four-element lens. 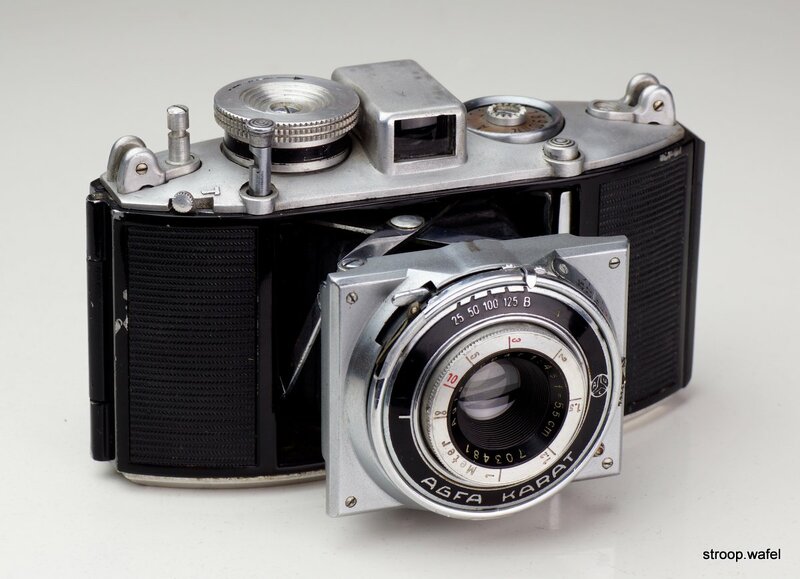 First version of the pre-war Karat 3.5 with strap lugs and Solinar 50mm f/3.5 lens in Compur-Rapid shutter, here pictured with an original Agfa lens cap. Same model but here with Compur shutter. Comparison of Compur and Compur-Rapid version side by side. Not only was the speed ring different, but also the shutter plate itself, which is rather unusual, on most cameras that were available with both shutters it was one or the other. A very careful observer may even notice that the aperture scales were different on both models, that is, the one on the Compur model has a small 'C' mark, whereas the one on the Compur-Rapid model has a small 'CR' mark. Despite what one would perhaps expect, there appears to be no difference in the aperture scale itself. The Karat 4.5 was a simplified version of the Karat 3.5 with a slower Oppar f/4.5 lens and a Pronto-style shutter with a limited speed range. The first version had strap lugs and was introduced in 1938. It had a small stripe as distance indicator on the shutter housing. This was the last Karat model to be produced that had the original style wind knob, with indented top, three ridges and a black painted ribbon around its base. One peculiar feature was the protruding screw used to secure the strap lug next to the wind knob. It appears this was the only Karat model that had this particular screw. Even though it seems perceivable that it may have served some sort of function, it appears too small to hold any accessories. First version of the Karat 4.5 with strap lugs. Note the peculiar screw to secure the strap lug next to the wind knob. 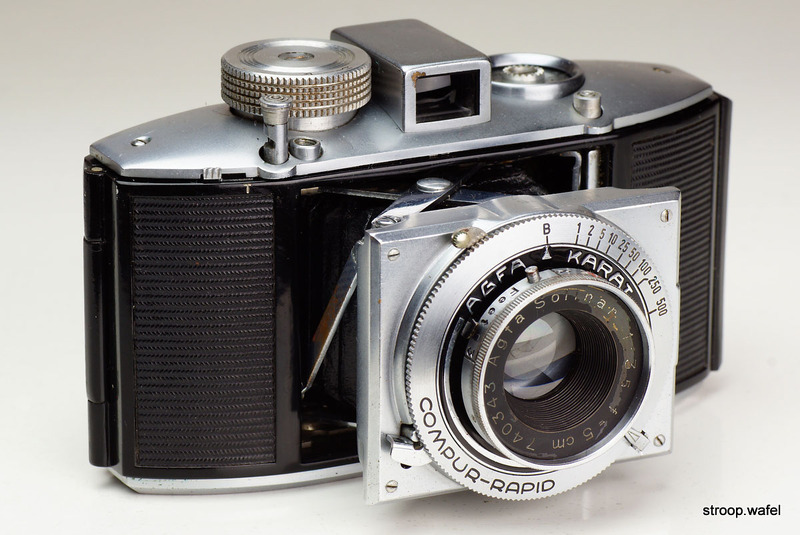 The Karat 6.3 was basically the same model as the Art Deco but without the decorated lens base. 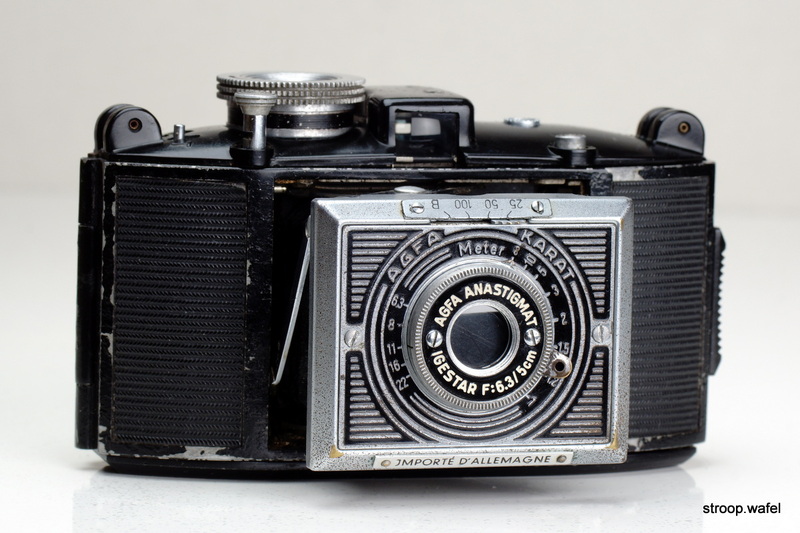 It had a slightly longer 55mm f/6.3 Agfa Anastigmat Igestar lens and had no strap lugs. The T button was the same as on the Karat 3.5. 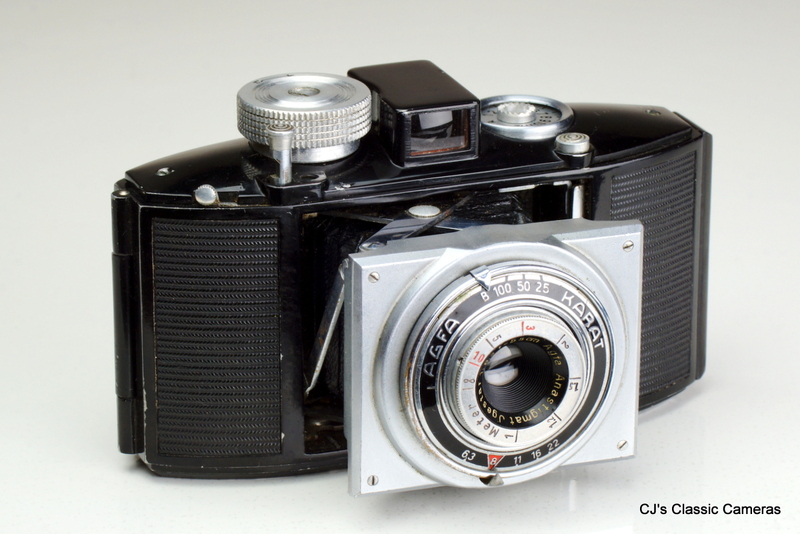 Early production had a small stripe as distance indicator on the shutter housing, like the first version of the Karat 4.5. Later production had a small arrow instead. It was the first Karat to feature the new wind knob with a flat top and 4 ridges. 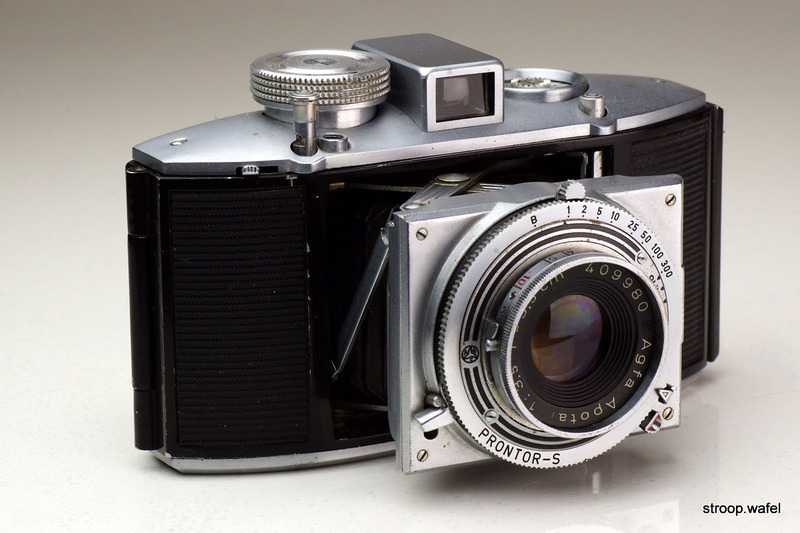 An early Karat 6.3 with a small stripe as distance indicator on the shutter plate. A somewhat worn later Karat 6.3 with an arrow as distance indicator. Another interesting feature are the 'Importé d'Allemagne' markings around the shutter, indicating this example was produced for the French market. The second version of the pre-war Karat 3.5 was introduced in 1939, around the same time as the Karat 6.3. There were several changes compared to the first version. First of all it no longer had strap. The T button had a different shape and the letter T was now on the black body frame instead of the top housing. The lens was black with white letters and a metal ring instead of silver with black letters. This version were the last Karats to be built before camera production was stopped in 1941 due to WWII. Second version of the pre-war Karat 3.5 without strap lugs. The second version of the Karat 4.5 also lost the straps lugs of the first version. Other differences were the new style wind knob and and an arrow as distance indicator on the shutter instead of a stripe. It still had the same top housing as the first version, with the original style T button, and thus differed from the Karat 3.5 version in production at the same time. 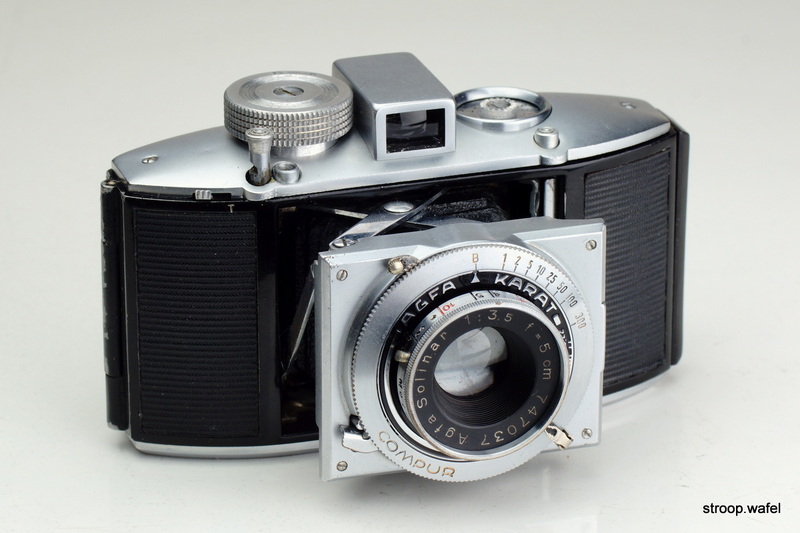 The second version of the Karat 4.5 with an Agfa Oppar 55mm f/4.5 lens and without strap lugs. 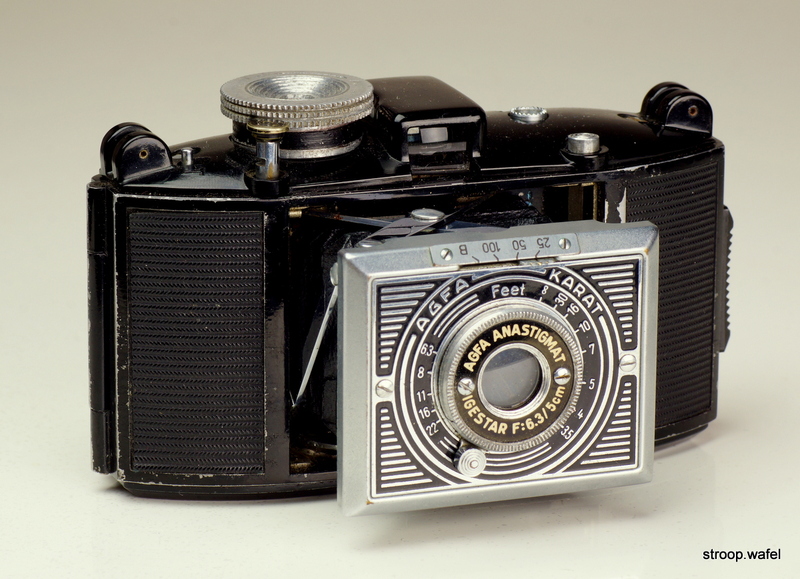 The post-war Karat 3.5 was quite similar to the second, pre-war version but featured a different lens and shutter. The lens was an Apotar, a three-element lens as opposed to the four-element Solinar. 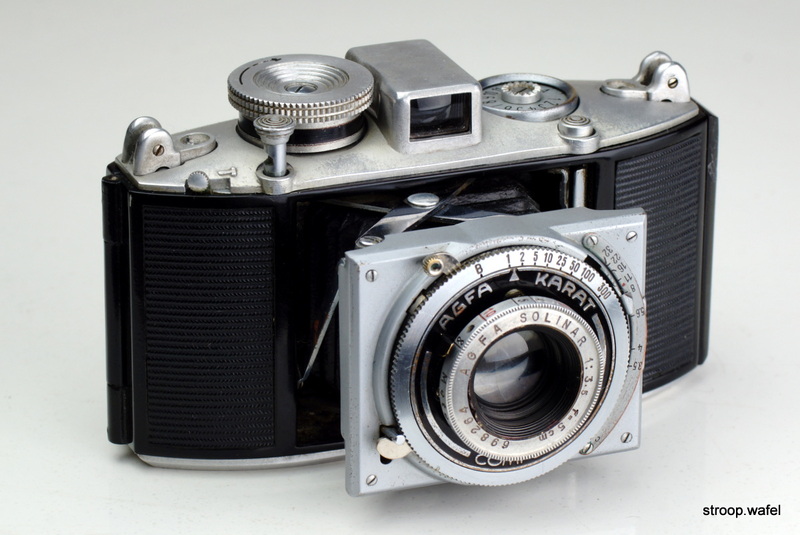 The shutter was a Prontor marked as Agfa Karat, the shutter plate also had shutter speed and aperture markings. Early production still had uncoated lenses, but soon all lenses were coated. A version with a standard Prontor-S lens as found on many other contemporary cameras was also produced. Based on the high lens serial numbers these were probably the last of Karat 3.5 to be built. A postwar Karat 3.5 with uncoated Agfa Apotar 55mm f/3.5 lens. Another postwar Karat 3.5 with coated Apotar lens, this time a fairly rare and late version with Prontor-S shutter.